Supermarkets and other food retailers are fuelling Scotland's obesity epidemic, according to new research. A report commissioned by Food Standards Scotland found that in-store promotions were heavily weighted in favour of food with high levels of salt or sugar. The Stirling University academics behind the report called for a "retail revolution" to help people choose healthier options. However, the study was criticised by the Scottish Grocers' Federation. It said the report failed to take account of the efforts already being made to promote healthy eating. Food Standards Scotland (FSS) said Scottish obesity levels, currently 30%, were projected to rise to 40% by 2030. 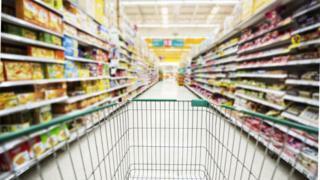 Professor Leigh Sparks, who wrote the report, told BBC Radio Scotland's Good Morning Scotland programme that there was an imbalance in the type of food promoted in shops. "If you look at the environment in store in retailing, then most of the promotions are pushing the products that are less healthy for consumers," he said. "A lot of the products have been supersized as well - boxes of crisps, bags of crisps are good examples of that." He said that manufacturers needed to make changes to the composition of their products, while retailers should provide more information for consumers and change their "balance of promotions". "I think retailers are increasingly aware of the issue and they're looking at what they can do," he added. "But most of the voluntary schemes that have gone on so far have not had the impact because of this overwhelming tide in terms of unhealthy promotions as well." The report also backs the idea of a sugar tax. FSS senior dietary adviser Dr Gillian Purdon said: "The report supports Food Standards Scotland views and recommendations for the need to extend sugar tax beyond soft drinks, to reformulate products to reduce sugar fat and salt, to resize portions, address less healthy food promotion and to provide clearer consumer information on products in both the retail and out of home sectors. "This report will help us to develop new approaches to improve the balance of food offered and promoted by the retail sector. "It is clear that a combination of measures will be needed overall to enable healthier eating. Regulation of promotions of high fat, salt and/or sugar food and drink within retail stores and out of home premises should be taken forward as a priority." Previous research by FSS indicated about 50% of less healthy food choices are purchased on promotions. For healthier foods, the figure is about 30%. The report added: "We conclude that the current context for consumer choice in-store is affecting the health and diet of consumers in Scotland. "Voluntary and self-regulatory approaches or relying on consumers to make 'good' decisions are not having sufficient impact. "It will thus be necessary to regulate to make the changes have real impact." Dr John Lee, of the Scottish Grocers' Federation, which represents food retailers in Scotland, said: "This report seems to ignore the significant efforts of retailers to actively promote healthy products in-store and the efforts of manufacturers to reformulate products and reduce calories. "Additionally, extending the sugar tax will make no real or lasting impact on diet-related problems. Improved food education and awareness should be the priority rather than constantly shifting the responsibility for population health onto retailers." SGF said more than 200 stores were participating in its Scottish government-supported Healthy Living Programme. The Scottish Retail Consortium said its members were committed to helping consumers make healthier choices and called for "regulation or legislation" on the issue. Ewan MacDonald-Russell, its head of policy, said: "Fruit and vegetables are heavily price promoted and there has been a proliferation of healthy alternatives. Just as importantly, our industry has led the way on reformulating products to reduce salt, sugar and fats from products, and in producing clearer and more informative labelling. "It's worth highlighting the number of products being promoted in total is falling in response to customer demands for simpler pricing. We will continue to engage directly with FSS and the Scottish government on this issue. However, any measures on pricing and promotions will have to be done through regulation or legislation; it's not feasible, or legal, to ask retailers to voluntarily take collective measures in this area. "Ultimately however, the best way to help improve Scotland's health is for government to take steps to ensure the whole food and drink industry is working collectively, on a level playing field, to ensure no matter where customers shop or consume they are able to make healthy informed choices."